Global competition, exchange rate fluctuations, and digitalization are still the main issues facing Swiss SMEs in 2018. International rankings show that Switzerland is one of most competitive countries in the world. How do SMEs rate this competitiveness? Credit Suisse's SME Survey answers this question and more. Make sure you stay one step ahead. International rankings show that Switzerland is one of the most competitive countries in the world. Switzerland took fifth place in the 2018 IMD World Competitiveness Ranking. But how do Swiss SMEs rate Switzerland in terms of competitiveness, and how do they rank themselves against the global competition? 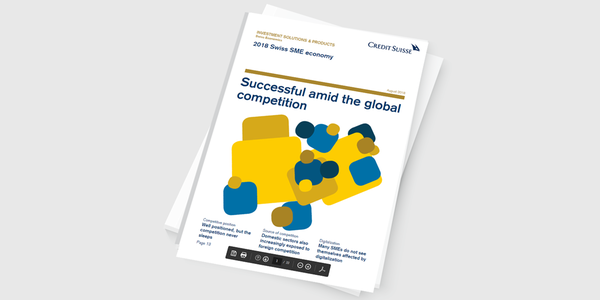 Based on responses from over 1,000 Swiss SMEs, Credit Suisse's SME Survey answers all of these questions and more. Overall, the findings are positive: Swiss SMEs consider Switzerland to be a genuinely competitive location. They hold this view despite the many challenges that constantly force them to evolve. These challenges include the growth of international competitors. Emerging countries are entering the market in ever greater numbers, for example, and these new players need to be taken seriously as a source of competition. Watch the video to find out how Swiss SMEs are overcoming these challenges and how sustainable Switzerland's competitiveness really is. Watch the video to find out more about international competition and what Swiss SMEs are doing to remain competitive despite exchange rate fluctuations and the trend toward digitalization. Credit Suisse's 2018 SME Survey reveals how Swiss SMEs rate Switzerland in terms of competitiveness, and how they believe their own companies are faring against the competition. Factors such as exchange rate fluctuations and the trend toward digitalization play a key role. Can Swiss SMEs overcome these challenges? Exchange rate fluctuations: To what extent are Swiss SMEs affected? Long-term movements in the CHF exchange rate are likely to be a key factor in the competitiveness of many Swiss SMEs. Looking back, we can see that exchange rate fluctuations and the Swiss franc shock in 2015 did not affect SMEs as much as was originally feared. However, a strong franc could make it challenging for SMEs to remain competitive in the future. 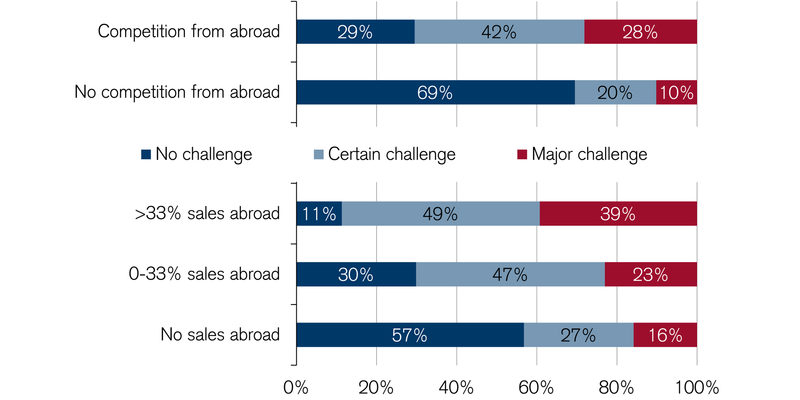 Our survey of Swiss SMEs reveals that those which compete against major foreign players are more likely to regard exchange rate fluctuations as a challenge than SMEs which do not. Swiss SMEs that generate more than 33% of their revenues from export sales also feel significantly more exposed to these fluctuations. SMEs without export sales feel less vulnerable. Almost 60% of them do not consider exchange rate fluctuations as a challenge at all. Digitalization: Risk or opportunity for SMEs? The fourth Industrial Revolution is sweeping the globe, and has also affected Swiss SMEs. Digitalization is a guaranteed driver of national and global competition, but Swiss SMEs tend to have a positive attitude toward this trend. Nearly 50% of SMEs in Switzerland believe that digitalization makes their companies more efficient. Only 16% of the SMEs surveyed regard digitalization as a risk to their companies. 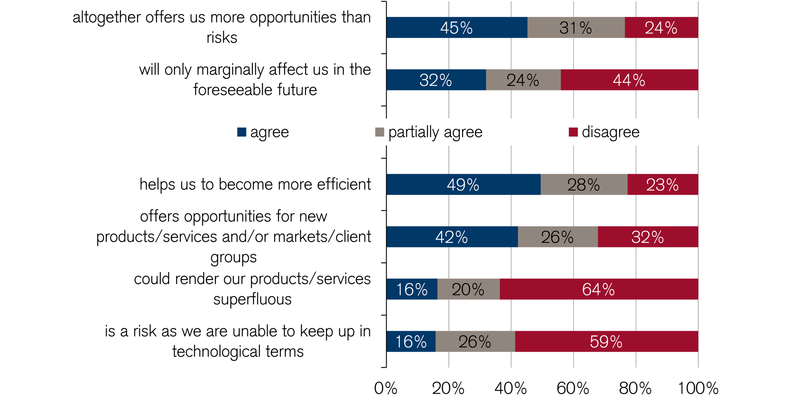 One-third believes that digitalization will not affect them in the foreseeable future. Although some of them may be correct in their assessment, it is likely that others are underestimating the impact of technological change. Vincenzo Montinaro, CEO of textile company AG Cilander, is also optimistic. He sees digitalization as a major opportunity. In an interview which appears in the SME Survey, the CEO says, "Digitalization drives technological progress forward and leads to improvements in terms of energy and process efficiency." AG Cilander is currently investing in the modernization of its plants, including in the area of digitalization. Vincenzo Montinaro and the CEOs of two other Swiss SMEs interviewed for the survey agree that Switzerland offers many advantages as a place to do business. Two major points in its favor are the high level of education and the expertise of its workforce. Yet it is difficult to predict how current challenges will impact SMEs, and what changes they will bring. Credit Suisse's 2018 SME Survey makes it clear that a large degree of innovation is vital to maintaining competitiveness at a high level over the long term.